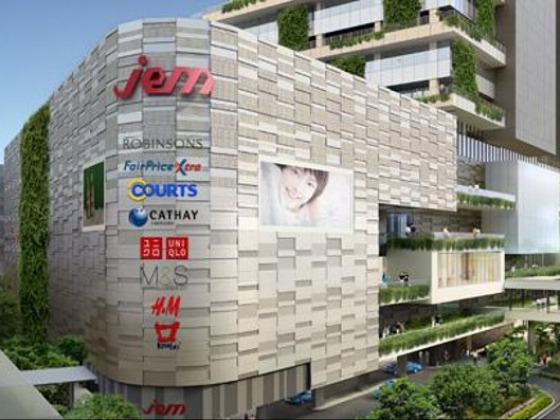 Jem is a commercial building situated at 50 Jurong Gateway S608549, in district 22. It is the 3rdlargest suburban mall, the gem of Jurong East estate. Jem is opened mid 2013. This elegant six storey building has about 818,000 sqft of retail space. Jem is managed by Land Lease which is a leading international infrastructure and property group. Jem has a sky park with rooftop gardens from level 5-7 to allow visitors to enjoy the natural greenery and scenery. Kids can also go to the marine themed playground at Jem’s park to play and interact with other children. Basement 1 is filled with many food and beverages outlets and dining restaurants which is a foodies’ dreamplace. The major retailer tenants here include Fairprice Xtra, H&M, Uniqlo, Robinsons, Cookhouse by Koufu, Courts and Marks & Spencer. Jem is connected to Jurong East Mrt station and Jurong East interchange. Other nearby MRT stations are Clementi and Chinese Garden stations. There are also several bus services available at the bus interchange. For vehicle owners, you should exit 27 on PIE and Exit 11 on AYE. If you are driving from here to the Central Business District will take you about 15-20 minutes. Major expressways such as AYE and PIE allow drivers easy access to any part of Singapore.